UNITED NATIONS, August 23 -- As the UN vies for a role in "post conflict" Libya, there is conflict inside the UN about how to proceed. Ian Martin, with outside consultants, prepared a report on the topic. Inner City Press is informed by a source familiar with the report that it advises not to count on the African Union. This has increased animosity between mostly African staff in the Department of Political Affairs' Africa Division and Ian Martin. They ask why a Brit who never went to Libya was given this position. Now as the UN considers who would be their top man in Libya, Martin wants the top. The Italians, sources say, are quietly trying to replace the UK in the lead of the UN's efforts on Libya. While listed as Argentinian, current DPA official Oscar Fernandez Taranco is also viewed as an Italian candidate for the future Libya job. Lead mediator Al Khatib, whose job was partial lost to Martin and is now largely moot, having failed, is also no fan of Martin, and reportedly opposed Martin going as an equal to meet with the National Transitional Council in Doha. The purpose of that trip, both Secretariat officials and diplomats says, is for the UN to hear what the NTC wants from the UN. But the NTC has itself already prepared reports on that, and it calls into question: what has Ian Martin been doing for all these months? Martin has assembled a team, based in the so-called Teachers' (TIAA-CREF) Building on Third Avenue, including staff seconded from the UK, and from UNDP (where Taranco used to work). But what have they been doing? Inner City Press on Tuesday asked Secretary General Ban Ki-moon's acting deputy spokesman Farhan Haq why a copy of the report UN consultant (and Dartmouth professor) Dirk Vandewalle has been bragging about having written for Ban would not be made available to the press and public, or at least to the member states. It is not public, he said. The in-fighting inside Ban's Department of Political Affairs takes place with DPA chief Lynn Pascoe viewed as a lame duck who is leaving, but who wants to undermine the UK which has long sought his job. Pascoe promoting Martin for the Libya post is view, by DPA sources, as a way to make UK re-capture of the top job at DPA less likely. But Martin is not a Conservative, these sources say, so it might not work. Beyond the in-fighting, many powerful countries don't much care who would lead a UN mission in Libya, as they are assured they could place their people in the mission, for any number of purposes. Meanwhile the UN Department of Peacekeeping Operations, leaderless even as Jerome Bonnafont receives cards from French politicians like Jean-Marie Bockel congratulating him for getting the top job, wants a piece of the Libya action. DPKO argues that they have the capacity, from previous missions, while Martin's team has little experience. If there is any police or peacekeeping component of a UN mission in Libya, DPKO takes it over. DPA wants to keep it, and may therefore paint an overly rose picture of the security situation, now and in the future. 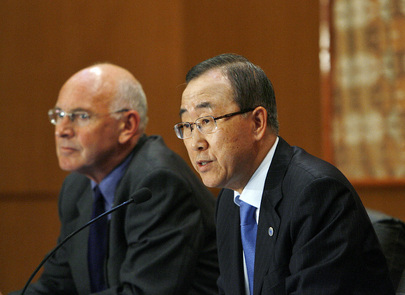 So even if or as Libya becomes "post conflict," it appears that Ban Ki-moon's UN will itself remain "in conflict." Watch this site.